Living in a work apartment brings one into contact with people one normally would never meet or necessarily have anything to do with. It also brings you into close quarters with their bad habits and faults. Especially when there are 4 of you in a 3 bedroom apartment that isn’t exactly sized like a penthouse suite. Let me put in a disclaimer here. My roommates are actually pretty good, in fact, about as good as you can get. But (a big BUT here), we are all human. We have our imperfections. Well, at least they do. The subject of this story is one of those roommates. He is actually a pretty nice guy. A six foot three hippiesque dude. Just a little ignorant and a little dumb. And loud. And doesn’t clean up much. And forgets to help buy the toilet paper and other supplies. And he has a mind like a giant sieve, anything you try to put into it filters straight back out. He isn’t perfect like I am. Did I mention he is a pothead? Now I do not attribute a lot of this to bad character flaws- I attribute it to his love of weed. Fortunately he doesn’t smoke it in the apartment. If he did I would no longer be perfect as I would become an unrepentant ax murderer. This is because I remember how many decades it took before there was legislation finally passed getting cigarette smokers and their vile habits out of public places where we had to share their vile habit with them. Now the pot lobby threatens to reverse all that with their insistence on their freedom of smoking when and where they want whether we want to breath it in with them or not. In the simple act of washing himself or his dishes after one one of his marathon cooking feats he will slowly and mindlessly use the equivalent of enough water to quench an Australian aborigine tribe for a year, THEN he will proceed to put all the dishes in the dishwasher and turn it on wasting even more water (the dishes are already clean). His showers keep our kidneys strong and in tone as we must wait for him to finish a Niagara Falls quantity waterfall while our urine slowly replaces our blood in our circulatory system. Twice, after listening to what sounded like the entire Mississippi River flowing through our kitchen and out into the storm drains I went and tried to impress upon him that we are living in a semi-desert and that, despite all the snow there is outside, we are in the midst of a drought. We shook his head yes, acknowledged the wisdom of it, then the knowledge I had passed to him immediately escaped out his ear and joined all the gallons of wasted water he had just fed to the sink. Of course, I must recognize the fact that he is from southern California where the art of wasting water is a training they get from childhood. I even went so far as to go out of my way to procure a ‘Please Do Not Waste Water’ bumper sticker that I applied to the bathroom mirror. Apparently this message entered into his eyeballs which then passed it on via nerves to his brain where it ran into a pot induced fog which successfully blocked it from getting to any neurological centers capable of processing that data and transmitting it to his hands, which continued on a daily basis to turn the taps on full blast while he meditatively and eternally brushes his teeth using water enough to save 50 illegal immigrants from dying in the Arizona desert. We have four people using one refrigerator. He insists on buying big gallon jugs of milk. I show him how I buy just half gallon boxes so that there is enough room for everyone. He agrees and says he sees that. Next day there is another gallon jug in there with the last one not finished yet. Bill Cosby, when his kids did something like this, called it ‘Brain Damage’. I don’t think scientists have truly found just the extent that residual pot in the head does to people. The extent of his pot addiction (go ahead, tell me that it “isn’t an addiction”. I dare you!) is when he comes home super high and decides it is a great idea to make one of his epic meals at 2 in the morning banging around the kitchen or to take a shower at 4 AM. That makes the rest of us love him so much that we want to hang him off the balcony using the shower curtain. BRAIN DAMAGE (go ahead, tell me it’s not!)! The best of all is the recycling. Any hippie worth his salt should care about recycling. If he doesn’t, he should have his hair shorn to Marine Corps length and be thrown in with the refuse on the next garbage ship to China taking our unwanted trash for them to rework. He sits gaming for hours next to the recycling pile which each of us is supposed to help bring down to the bins. Will he do it? Nope. He can’t even change to toilet paper roll. Nyet. He will let it get down to the last couple pieces, pull out the new roll, set it on top of the old one and let someone else change it. When he finishes with a box or jar that could be recycled he is too lazy to put it in the recycling bag. He conveniently throws it away in the trash container by his feet. Someday soon I am sure that scientists will find that little molecules of marijuana enter into the individual cells of the brain and block them from accepting any new knowledge and information. 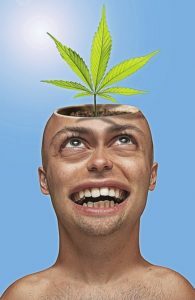 The user still feels he is more enlightened than other people because the weed puts up illusions that all is well and blissful in his world while the brain is actually suffocating from lack of air and intelligence. The possessor of the brain goes on through his life blissfully ignorant that he has been successfully dumb-downed by a plant.